The Review of Australia’s VET sector was recently completed and published. This Review, conducted by the Honorable Steven Joyce, a former New Zealand Minister for Tertiary Education, Skills and Employment, argues that there needs to be a significant upgrade to the architecture of the VET sector so it can successfully deliver the skills needed for Australia’s future. 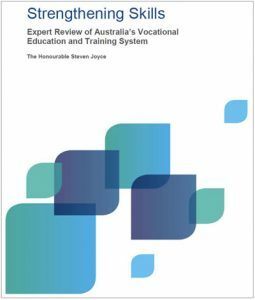 It proposes a new vision for vocational education in Australia as a modern, applied and fast-paced alternative to classroom-based learning. This Review recommends a six point plan for change and a roadmap for achieving it. The plan seeks to deliver a stronger skills sector which is a positive choice for many more Australians, whether they are starting their working lives or need new skills to advance their career. Greater access for disadvantaged Australians.